2002 turned out to be the year of the block figure. Kubricks found their way to the US in ever-increasing numbers, Smitis rocked out, I-Men defended the universe, and even DC Comics resurrected their Pocket Superheroes. Everybody, it seemed, was getting in on the game. But the best of the batch, easily, were Art Asylum's Minimates. Standing 3" tall, the Minimates were tiny versions of all AA's products: Crouching Tiger, Star Trek, Dark Angel... everything got miniaturized. 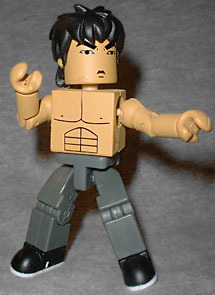 Even martial arts legend Bruce Lee became pocket-sized. The most iconic image of Lee is his bare-chested entry into the hall of mirrors in Enter the Dragon. Art Asylum captured this look with their "Brave Little Dragon" figure, first with a 7" figure and now with a Minimate. Bruce is built from the same generic blocky body as every other Minimate; like all the rest, he's just molded in the proper colors and then detailed with paint apps. Wearing the dark pants and white-soled shoes you would expect, MiniBruce moves at the ankles, knees, hips, waist, shoulders, elbows, wrists and neck. His tousled hair (complete with tiny ears!) is a separately molded piece that plugs into his head. He comes with nunchucks and a bo, as well as a puzzle piece base (something that apparently comes with all the Minimates). The Minimates packaging was nominated for a 2002 ToY award. The figure rests in a half-circle plastic tray with their accessories in a bag behind them. This tray is inside a tubular package with a twist-off base. It looks nice, is resealable, and just as interchangeable as the figure inside. At ToyFair 2003, Art Asylum announced that they'd be producing Minimates based on The Lord of the Rings and Marvel Superheroes. Though they're scheduled to be a bit smaller, I still can't wait to see them on shelves. Looks like a good year for the inmates.